As the Windows 8 tablet selections continue to expand, some have nevertheless found themselves discouraged by the flurry of compromises which have to date riddled the various candidates. 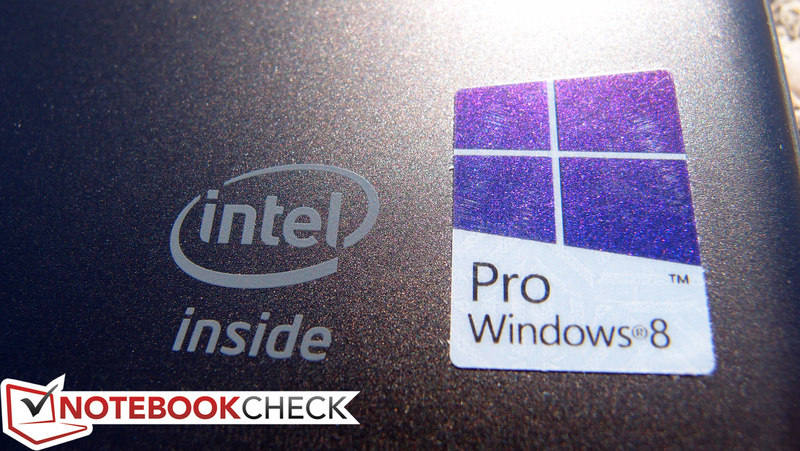 With the release of Lenovo’s ThinkPad 8, however, we find another valuable option, with specs rivaling the best competing OS tablets, and bolstered by some valuable new (and overdue) enhancements to Windows’ handling of touchscreen-only devices. Unlike previous competitors, such as the Dell Venue 8 Pro and Toshiba Encore 8, the ThinkPad 8 features a higher-resolution screen (1920x1200, WUXGA) and more powerful parts—though it’s also a bit pricier, with a starting MSRP of $399 (our review unit, meanwhile, runs $499). Inside this sleek aluminum case you’ll find a quad-core Intel Atom Z3770 running at up to 2.4 GHz (the latest in the Bay Trail-T series of SoCs), 2 GB LPDDR3 RAM, and a 64 GB (or larger) embedded multimedia card for storage—nothing to sneeze at in the world of passively-cooled technology. If you’re wondering whether the additional price premium is justified, as well as whether this tablet really has a home in the corporate world—so are we. As always, we’ll let our benchmarks, measurements, and intensive analyses do the talking. Without further ado! 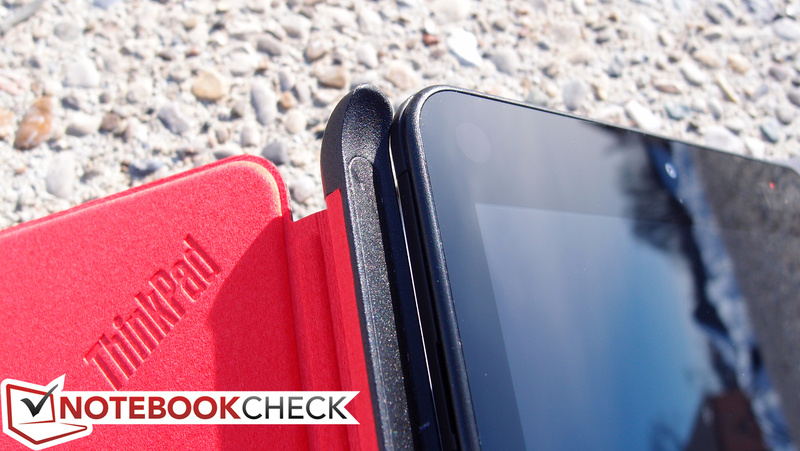 With a weight of just 408 grams and a thickness of a mere 8.8 mm (around 1/3 inch), the ThinkPad 8 is nothing if not portable. 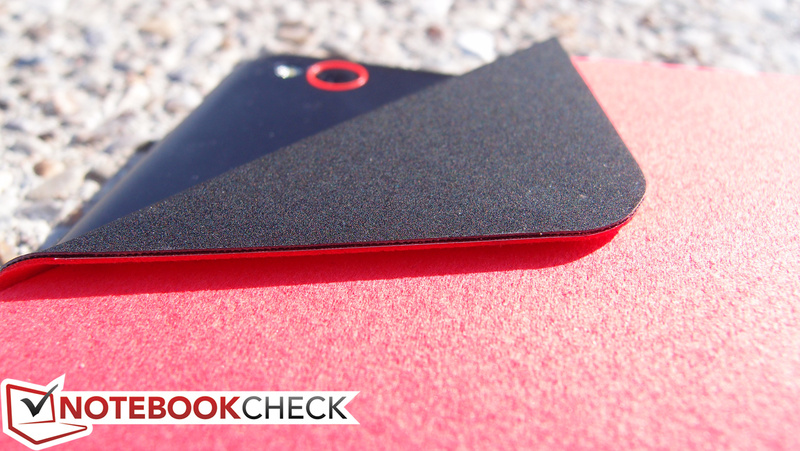 Coupled with its rounded edges, this makes the device very comfortable in the hand. It immediately impresses with the subtle confidence of its design and a svelte use of sparse accents. Apart from black (and near-black), the only hint of color adorning the aluminum casing is the reflective touch-sensitive Windows button below the screen, the thin red camera border, and the ThinkPad logo, the “i” of which lights up on the back of the unit to indicate the current status (as with modern ThinkPad notebooks). 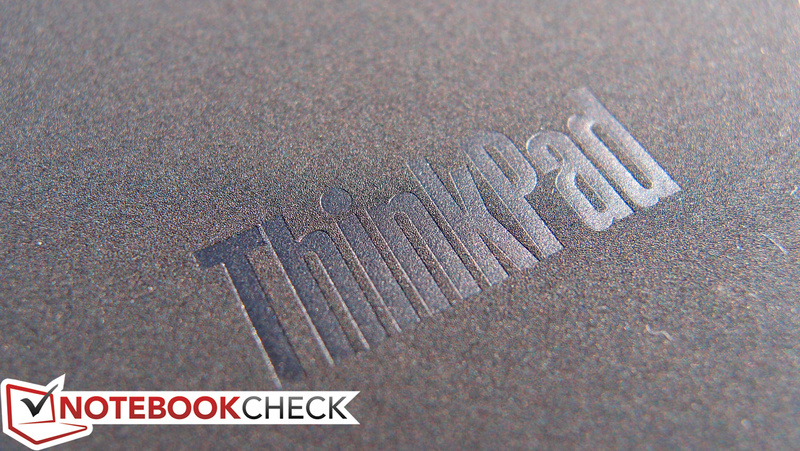 It’s all business in terms of its styling, as any ThinkPad ought to be. 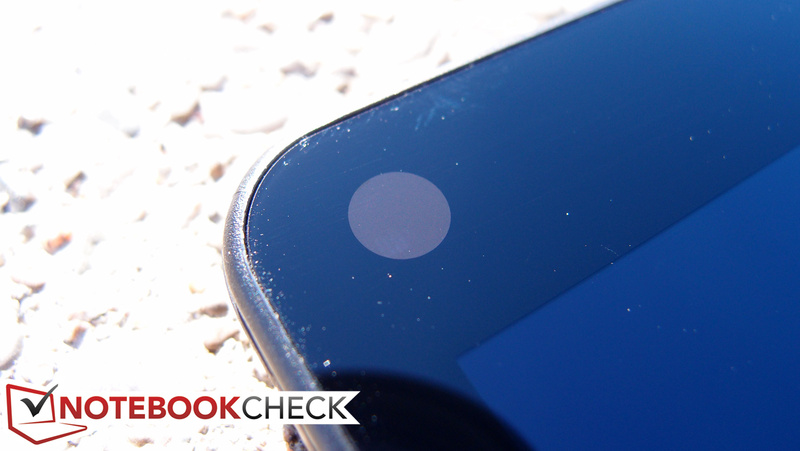 The buttons are well-placed, but less-than-ideal in their design, as they’re nearly flush with the edges of the device. This makes them both difficult to locate by feel alone and a little bit more challenging to press than we’d like. The touch-sensitive Windows button provides ample tactile feedback, which makes its occasional operation easy enough to avoid fuss. 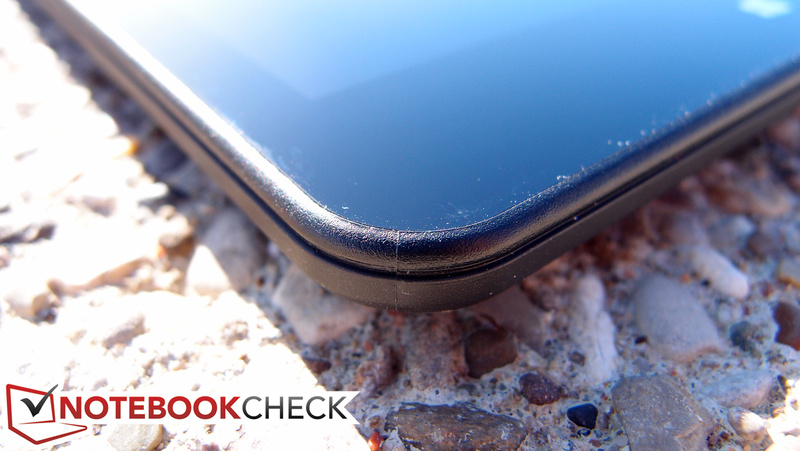 A thin rubberized border protects the edges of the entire device, with what feels like durable plastic wedged between it and the edges of the screen. The screen itself is covered with Infinity AGC Dragontail glass, which is a competitor to the popular Corning Gorilla Glass (and which boasts comparable levels of defensive resilience). Rounding out the assortment of construction materials is the aforementioned aluminum, which wraps around the entire back of the unit. 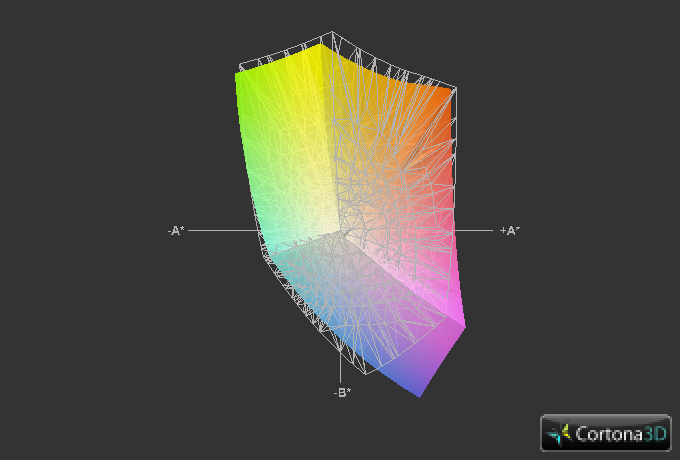 The tablet feels appropriately sturdy, though it does falter a bit in the realm of torsion resistance, and heavier targeted pressure on the back can produce visible distortions on the LCD panel. Since most every component (including the RAM and storage device) is soldered directly to the board, the ThinkPad 8 doesn’t really offer much that can be replaced in the event of a failure. 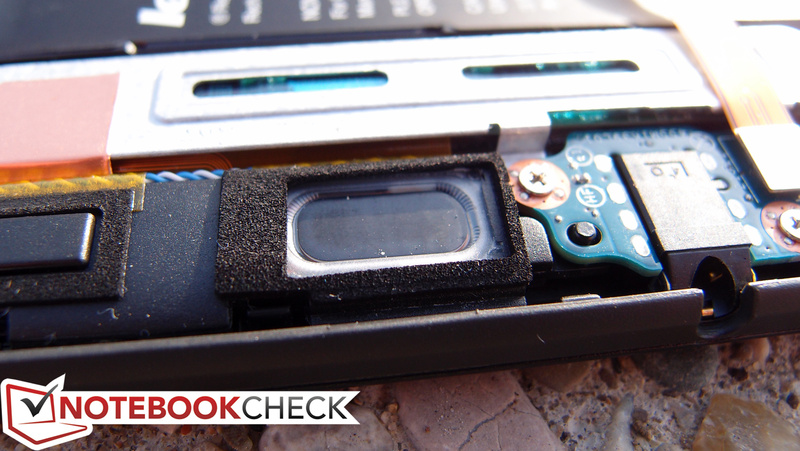 Should you ever need to reach the innards, however—say, to replace the internal battery—it’s possible with the help of a small Phillips-head screwdriver (for a single screw on the side) and a plastic scribe for prying up numerous clips around the perimeter of the aluminum back cover. 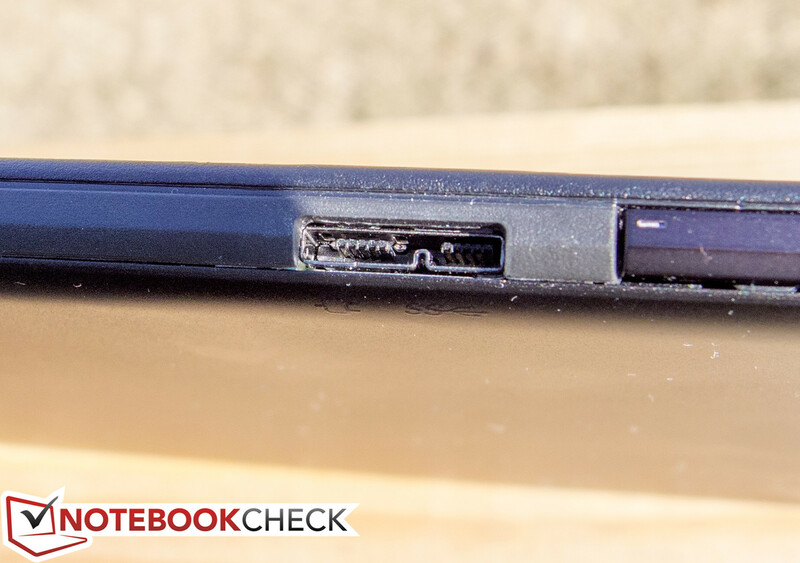 In terms of available ports, the ThinkPad 8 has recent competitors beaten due to the inclusion of USB 3.0. 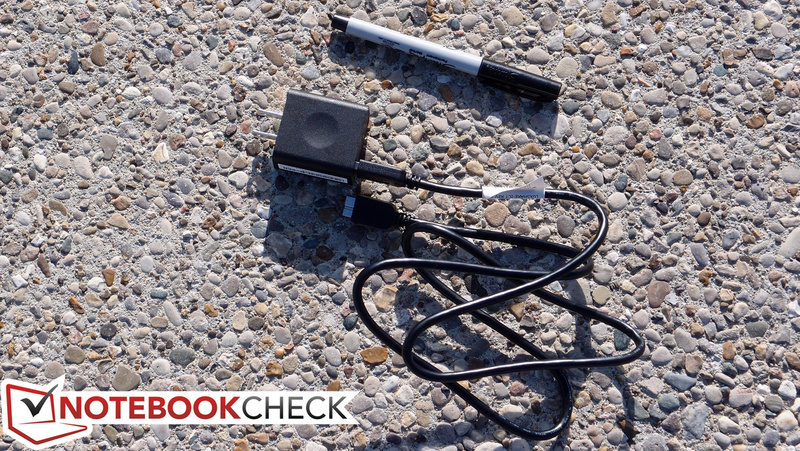 Although it’s USB Micro B (2.0A), which is a lesser-seen connector type that normally is found on external hard drives, conventional Micro USB cables can still be used. The rest of the ports are par for the course, with the left side of the unit featuring mini-HDMI (always appreciated) and a flap protecting the micro-SIM card slot and the micro-SD card reader (which accepts cards of up to 64 GB in capacity). The opposite side features only the buttons and USB 3.0/charging port, while the audio jack rests on the center of the bottom edge. 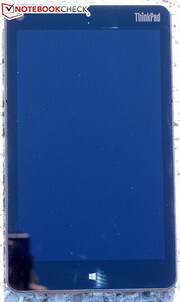 Dual mics flank the touchscreen for stereo recording, while the front-facing camera and ambient light sensor are above it. 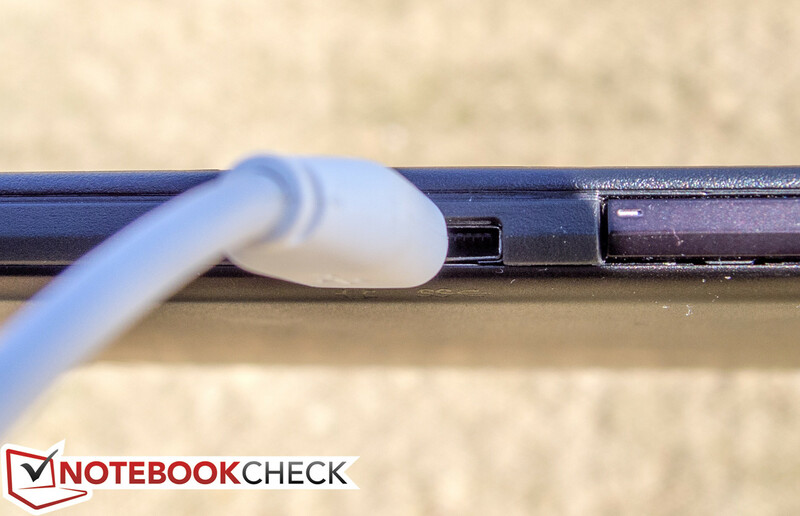 Using a standard micro-USB to Female USB adapter, we tested operation with a mobile USB 3.0 hard drive. 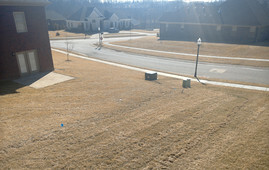 We experienced no problems using the hard drive under this configuration without the need for an external power source. 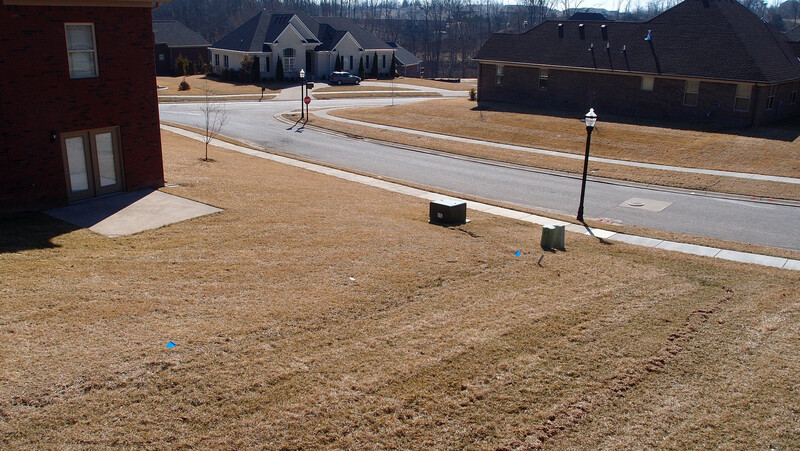 We experienced no problems with connectivity from the ThinkPad 8’s included Broadcom 802.11a/b/g/n Wireless SDIO adapter, which is a dual-band, 2x2 model that also features integrated Bluetooth 4.0. Like all tablets, without the luxury of a dock or other external adapter, there is (of course) no way to plug into a corporate network using Ethernet. 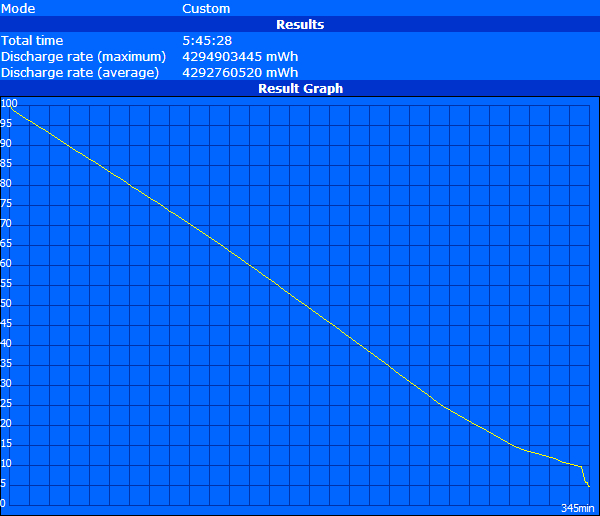 The AC adapter that ships with the ThinkPad 8 is nice and compact. The entire adapter (including the heavy-gauge detachable USB cable) weighs in at just 118 grams—a big plus for portability, though the cable is quite short (less than 4 ft). Also appreciated by some will be the lack of a ground prong. 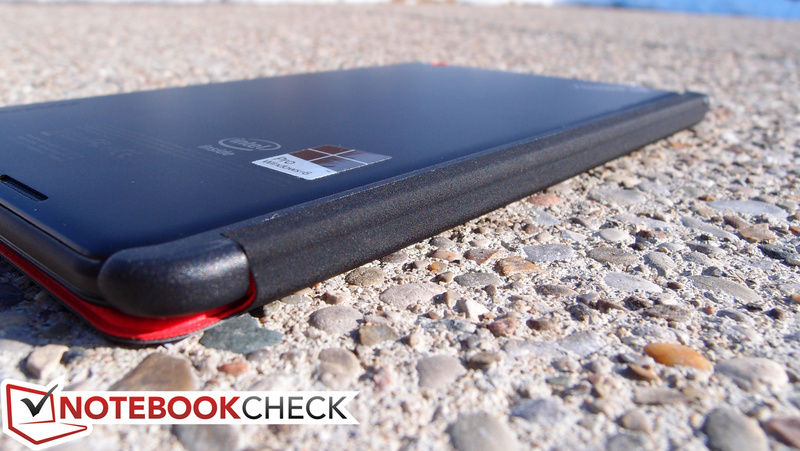 Meanwhile, while it isn’t included, also available is a little flip case (called the ThinkPad 8 QuickShot Cover – MSRP $34.99), and it’s fantastic—essentially, everything one could ask for in a cover. It fastens along the left side of the unit through the use of a series of magnets on the spine, after which it feels quite secure in its bond. It feels rigid and sturdy with a soft-touch finish on the outside and a microfiber layer on the inside to protect the screen while it’s closed. Also thanks to the use of magnets, the cover automatically wakes and sleeps the device when open/closed, without any fuss at all. Why is it referred to as the “QuickShot” cover? Because the corner folds down while it’s opened behind the unit and attaches (again, magnetically) securely to uncover the rear camera lens—a really cool design. 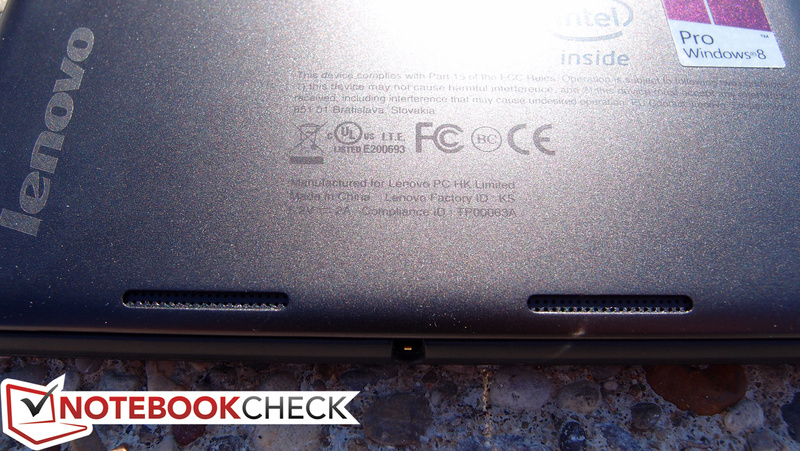 There’s even a raised rubber strip along the opposite end of the cover so that the tablet can be stood on its side. 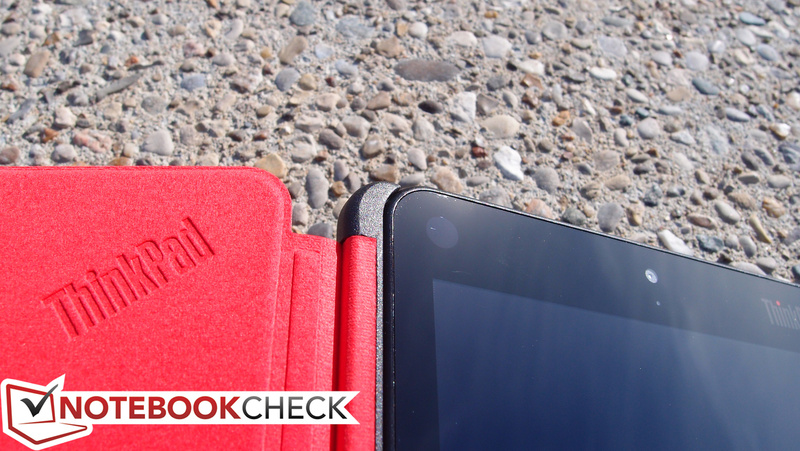 Best of all, the cover only weighs 122 grams (although that is 37% of the tablet’s total weight), bringing the grand total for tablet and case to just 530 grams. If you ask us, it’s a must-have accessory; too bad it’s sold separately. There is one last accessory we’d love to have been able to evaluate: the fabled docking station. It’s unfortunately not yet available, but it would provide access to a much-needed integrated keyboard, which (as we’ll get to in a bit) would go a long way toward making this feel like a well-rounded business device. 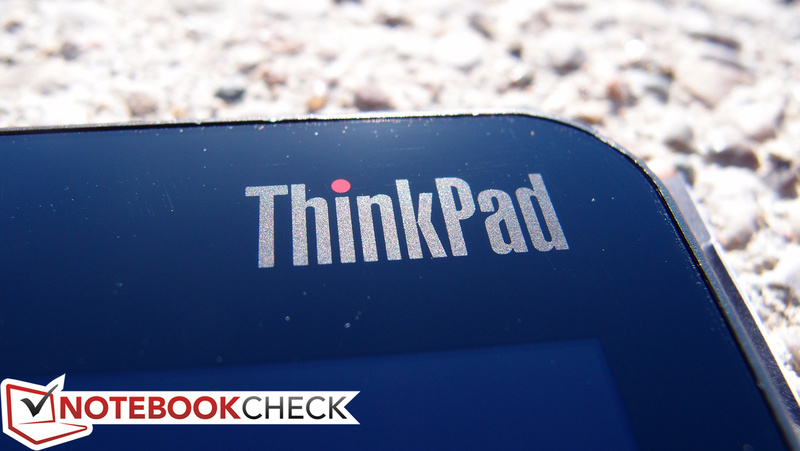 It’s worth taking a moment to discuss the included software on the ThinkPad 8. 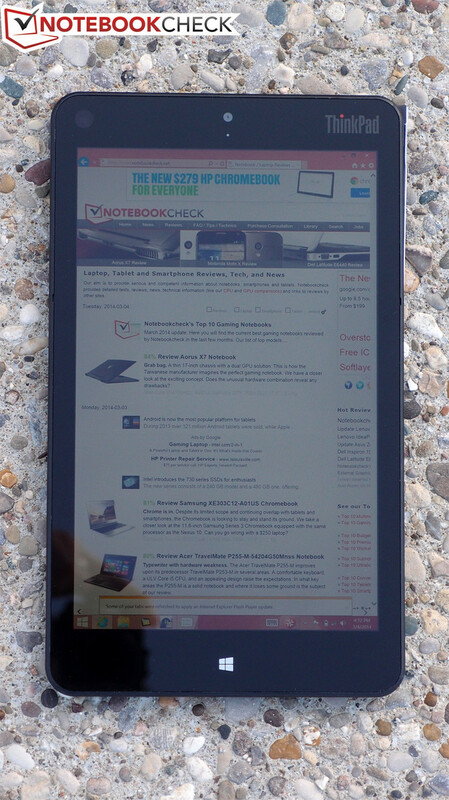 Unlike many previous tablets of its stature, it includes fully-featured Windows 8.1 as opposed to Windows RT, which is a huge plus. It’s quite nice that this also includes Microsoft Office Home and Student 2013, but in our configuration, it doesn’t—simply because it’s Windows 8.1 Pro. 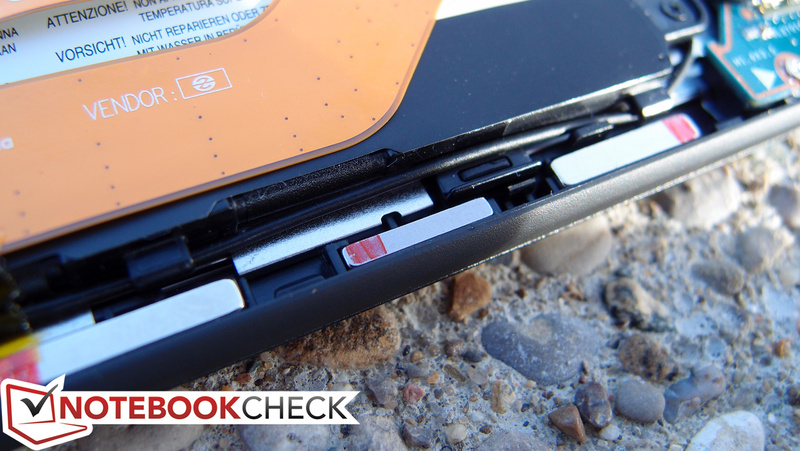 The ThinkPad 8 comes standard with a 1-year depot warranty. The only integrated input device on the ThinkPad 8 is the 10-point multi-touch screen, which is certainly comfortable and responsive (we had no problems with gestures, accuracy, or anything else). The issue that this creates, however, is a matter of resolution and Windows’ fundamental design. Yes, the ThinkPad 8 is a business-oriented device, and yes, it’s good that it includes full-blown Windows 8 for that purpose, but navigating Windows using touch is difficult unless the various visual elements are large and easy to isolate with a tap. 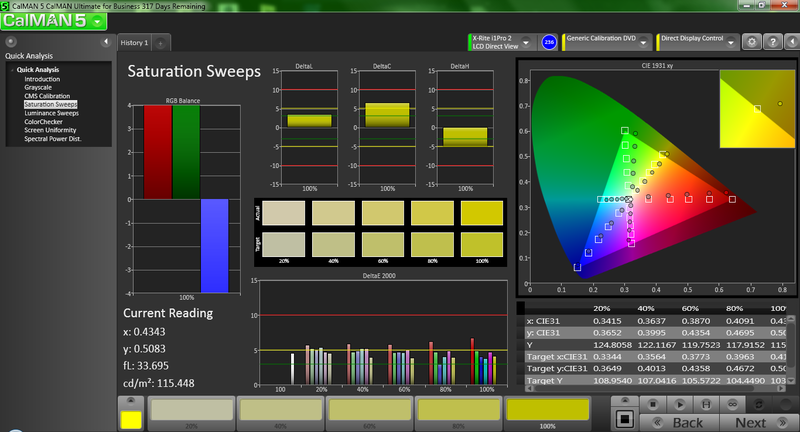 The ThinkPad 8’s WUXGA resolution might be stunning and well-appreciated when the real estate or clarity is warranted, but it also inherently makes window control elements and other items much more difficult to finger—even after heavy DPI scaling is applied. Worse yet is the lack of a stylus or any sort of digitizer support, which is something we would have expected from a business tablet. Likewise, the on-screen keyboard is a far cry from a hardware replacement. There were even plenty of times when we yearned for a mouse or at least a touchpad with physical buttons; some operations are just too difficult when relying entirely on touch. This is the same sort of struggle that we find with nearly any business tablet running Windows: it’s just a bit too complex and dependent upon pointer precision to be controlled fully using touch. As for the keyboard issues, they’re common across all tablets independent of operating system—but since the ThinkPad 8 truly is aiming to find a spot in the workplace, it’s held to a different set of standards than the average entertainment-only device. 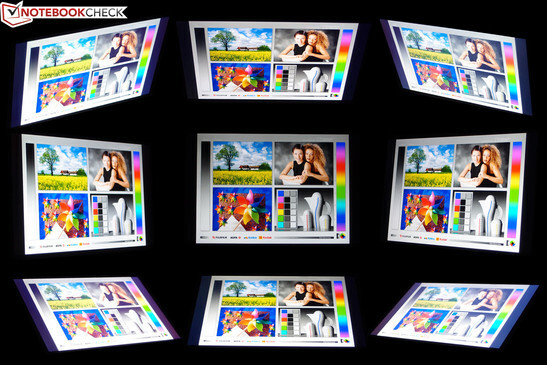 The 8.3-inch WUXGA (1920x1200) glossy IPS display on the ThinkPad 8 could certainly be described as beautiful, with subjectively great contrast, good color intensity, and reasonable brightness. 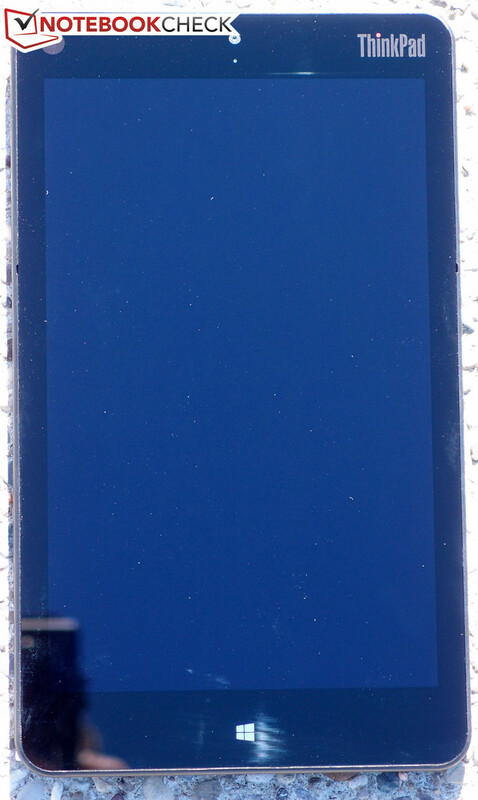 In terms of pixel density, it rivals the best devices with 273 PPI. The LCD panel manages an average brightness of 304 cd/m²—middle-of-the-road, yet most certainly adequate nonetheless. As with many tablets, the brightness of the screen is preconfigured to automatically adjust based on the readings of the ambient light sensor, though this feature can quickly be disabled within Windows. In terms of contrast, a reading of 720:1 (thanks to a good black value of just 0.463 cd/m²) corroborates our subjective first impressions. 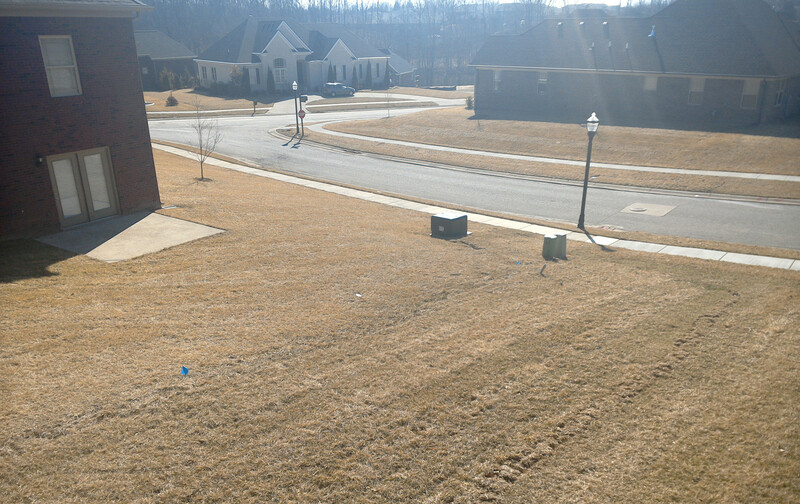 Brightness distribution is reasonable at 83%. 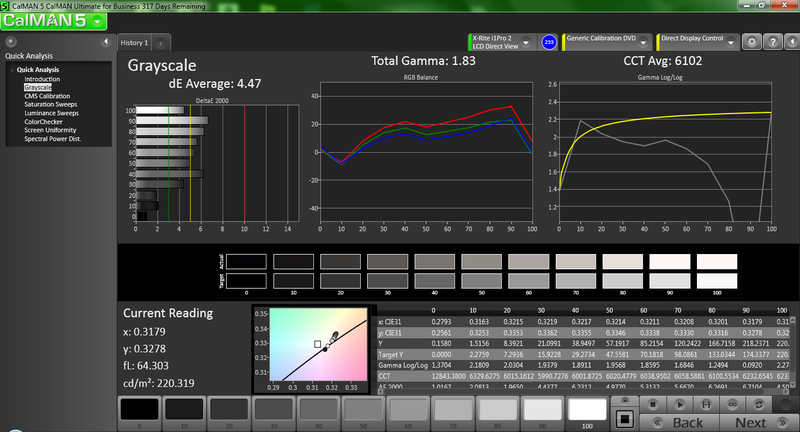 The ThinkPad 8 manages 76% coverage of the sRGB spectrum, which is good enough for most everyday purposes (provided the user isn’t given to frequent photo editing or graphic design). 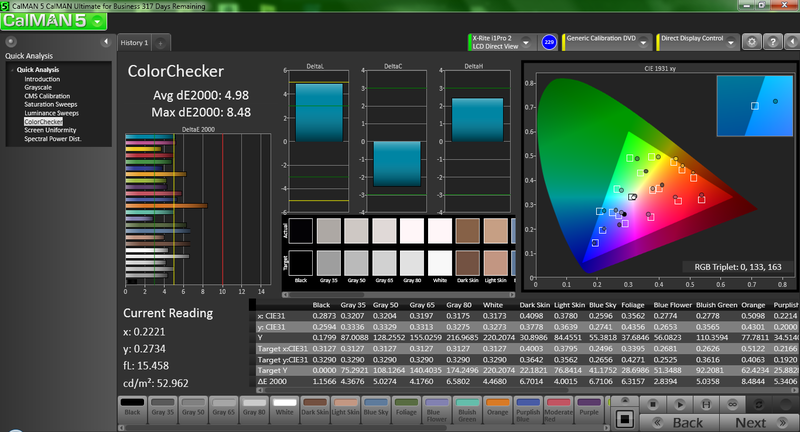 Moving on to color accuracy, the panel’s average deltaE post-calibration of just 4.98 represents a fairly good overall performance. Several colors notch values just above the 5 deltaE mark (the level where color deviation begins to become visibly apparent), but only orange is significantly aberrant, with around an 8.5 deltaE total. Elsewhere, total gamma is a bit low at just 1.83, and the CCT average is just a little on the warm side (6102)—but on the whole these are good readings, especially for a relatively inexpensive device. 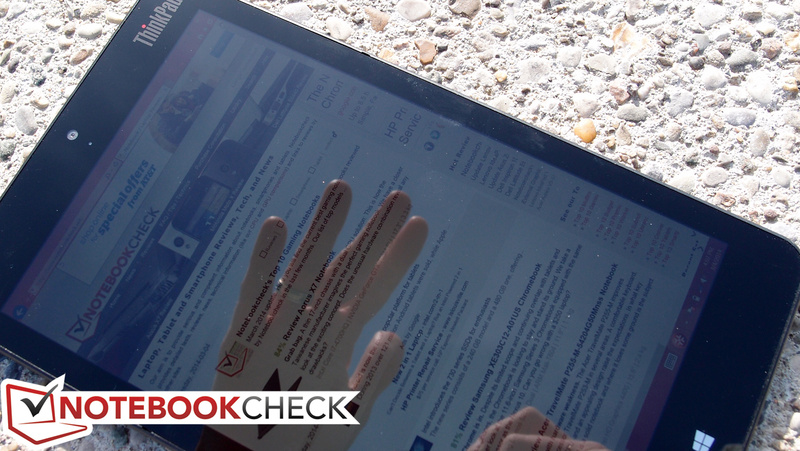 Finally, outdoors, the tablet is easily usable in most shaded areas, but in the sun, the same limitations apply as with nearly all glossy touchscreen devices. 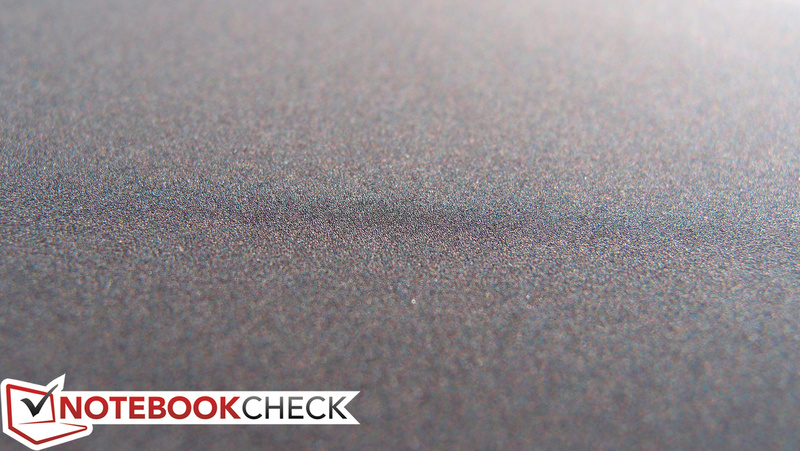 That is, reflections are obtrusive and annoying, exacerbated by the incidence of fingerprints and smudges (even though the ThinkPad 8 claims to resist them). 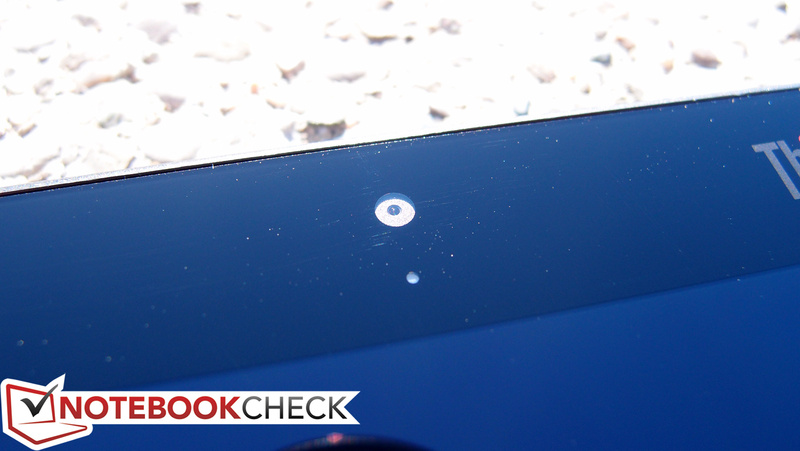 Viewing angles, meanwhile, are as positive as we’d expect for an IPS panel. 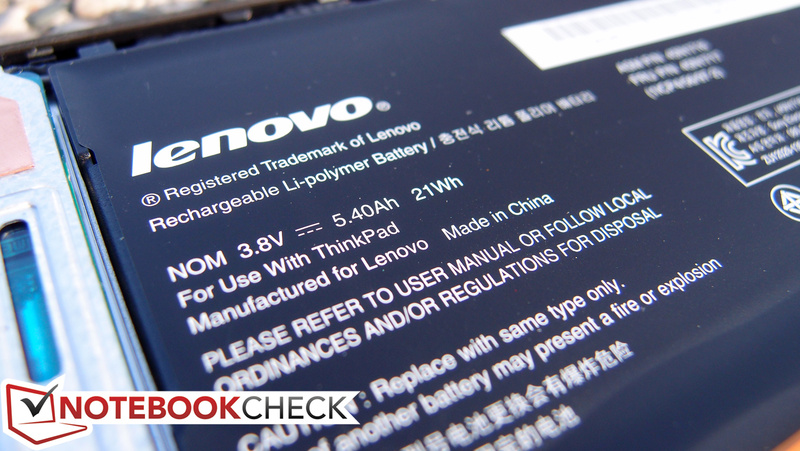 The Lenovo ThinkPad 8 only features one processor option: the quad-core Intel Atom Z3770 SoC, which is clocked at 1.46 to 2.4 GHz. 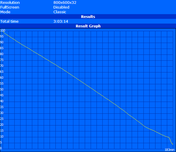 In terms of memory, 2 GB of dual-channel LPDDR3 RAM (clocked at 1066 MHz) renders general performance pretty snappy. The tablet’s performance does not diminish while operating unplugged; we performed a secondary run of 3DMark 11 while running on batteries only and found no significant difference in results. 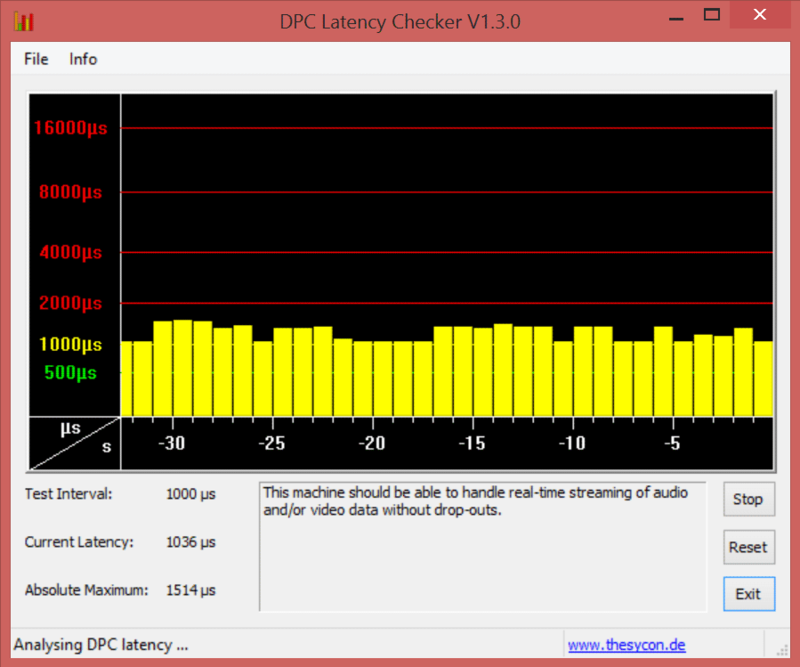 Meanwhile, our ceremonial testing with DPC Latency Checker revealed only minor latencies which should not adversely affect the streaming of real-time audio and video. The Intel Atom Z3770 SoC is a 22 nm chip with tri-gate transistors and is part of the Bay Trail-T platform. Best of all, the entire package is rated at an SDP of just 2 watts (translating to a TDP of under 4 watts), which makes it perfect for passively-cooled devices like the ThinkPad 8. 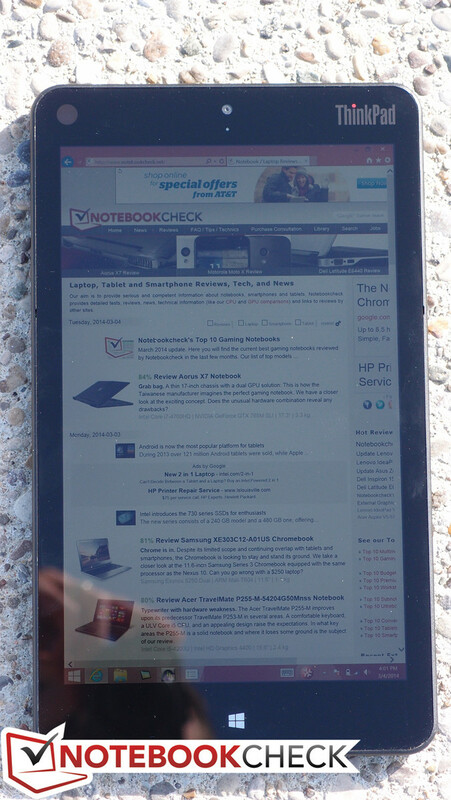 Numerous other efficiency improvements also combine to make this one of the better options for modern tablets. 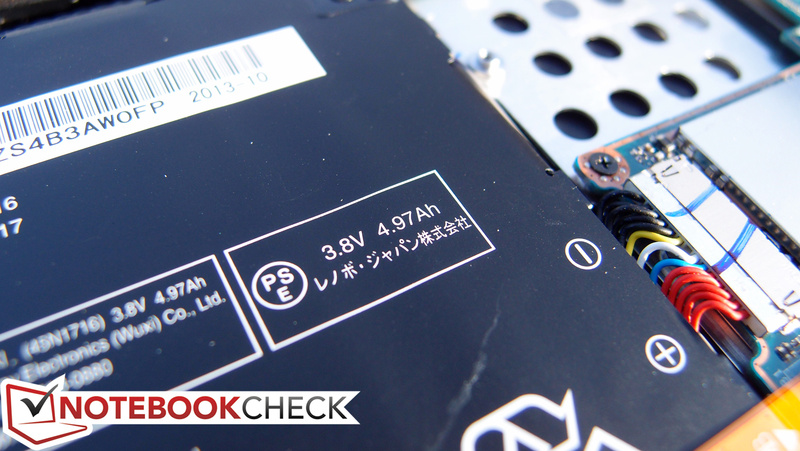 CPU benchmarks versus other Z3770-equipped tablets are somewhat disappointing. 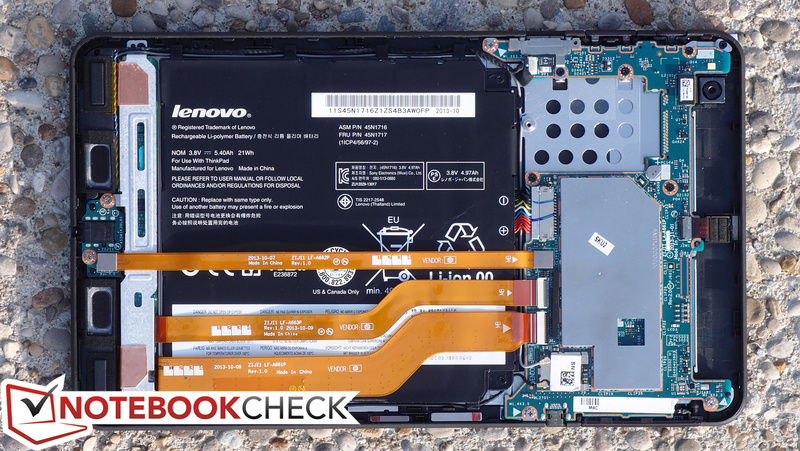 Our tests place the ThinkPad consistently below other tablets featuring the same SoC—though only one of these is an actual production model (the HP Omni 10 5600eg). However, the Omni performs at least 10% better in most of these benchmarks (1566 seconds vs. the ThinkPad 8’s 1756 seconds in superPi 32M, 1330 vs. 1212 in 3DMark 11’s Performance Physics test), and sometimes much better (17558 vs. the ThinkPad 8’s 12198 in 3DMark Ice Storm Physics, 3939 vs. 3308 in Cinebench R10 xCPU, and 838 vs. 1126 seconds in wPrime 1024m). 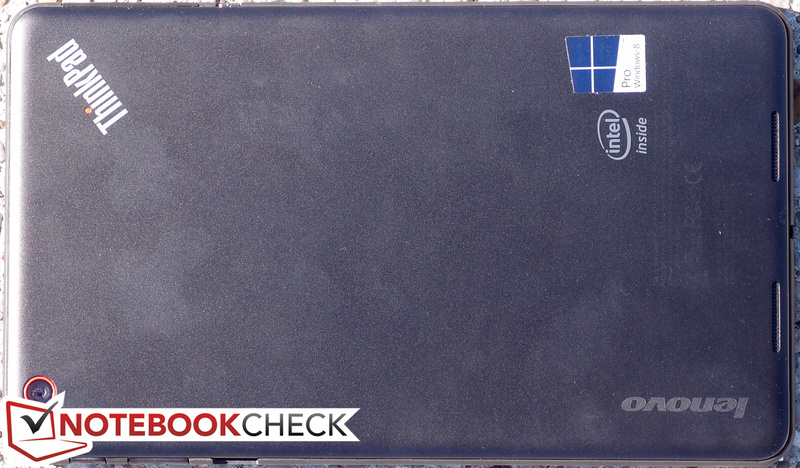 Compared to CPUs common in other recent tablets—such as the Toshiba Encore 8 and the Lenovo Miix 2—the biggest difference in the Z3770’s case is that it’s potentially clocked much higher at 2.4 GHz max versus 1.86 GHz max (except in comparison to the Dell Venue 8 Pro’s Z3740D, which also only features a single-channel memory controller and a lower maximum display resolution). However, keep in mind that this only applies when thermal headroom exists to support the higher clock rates—so perhaps that explains why we see average benchmark scores for the Z3770 of much closer to Z3740’s results than the differences would suggest on paper (closer to 5 – 6% greater in most cases—such as in wPrime and superPi—with never much more than 10%—such as in 3DMark Cloud Gate Standard Physics). 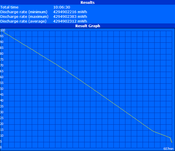 While our processor benchmarks are disappointing, general system performance is much more positive. With PCMark Vantage and PCMark 7 scores of 5229 and 2560 respectively, the ThinkPad 8 is near the top of all tablets in its class, and it even rivals the general performance scores of larger and higher-voltage devices such as the Microsoft Surface Pro 2 (4808 and 3012 in those same benchmarks). 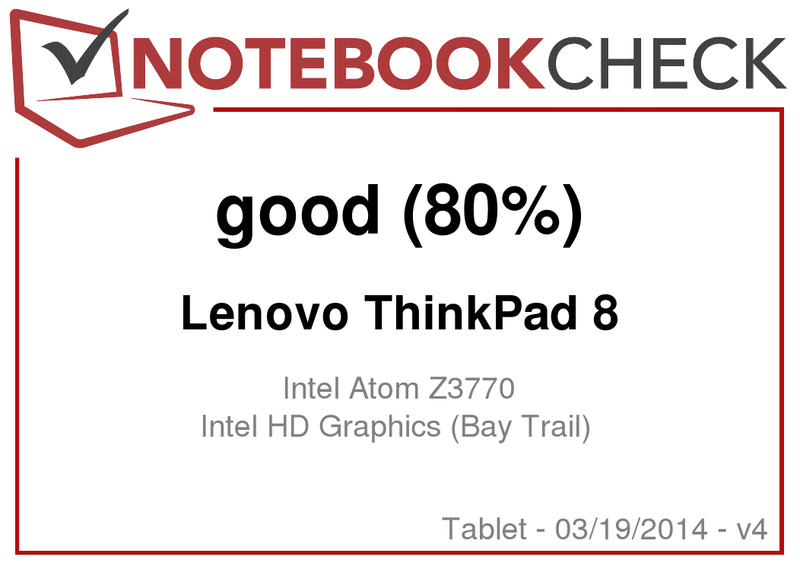 It’s true that this isn’t a massively better result than the Dell Venue 8 Pro’s 2317 or the Toshiba Encore 8’s 2497 in PCMark 7, but it is a huge step forward from the ThinkPad Tablet 2’s 1437. With regard to the latter, a Geekbench 2 comparison also reveals the undeniable impact of the new Bay Trail-T SoC, with the ThinkPad 8 scoring 3063 versus the ThinkPad Tablet 2’s 1257. For storage, our ThinkPad 8 included a 64 GB eMMC (a special multimedia card) from SanDisk (model SEM64G), formatted to 58 GB usable space. This is sort of like the poor man’s SSD; read/write speeds and other attributes suffer, but it is much less expensive, too. 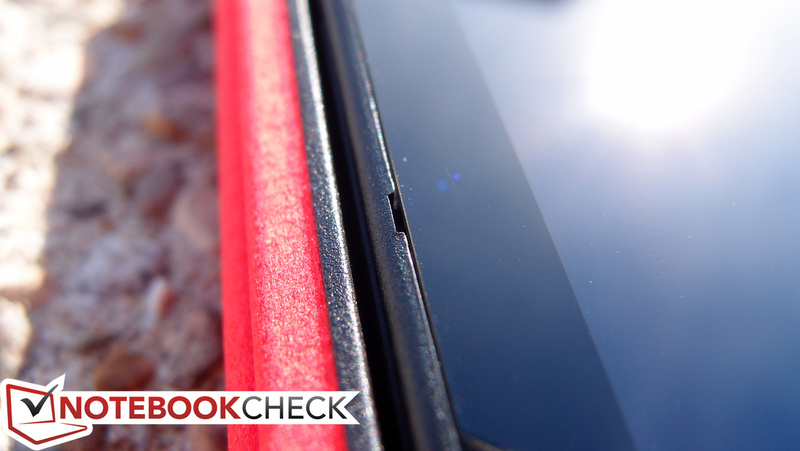 If more space is desired, a Micro SD slot is included under the left edge flap. 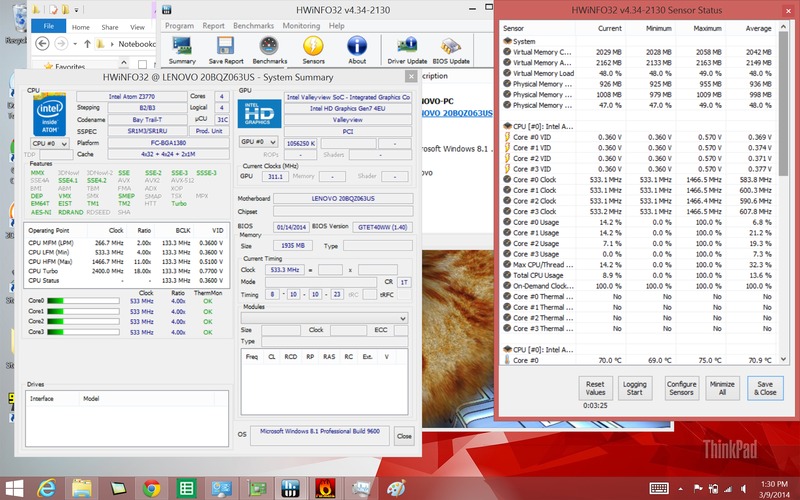 AS SSD did not want to run on the ThinkPad 8, but we were successful in getting HD Tune and CrystalDiskMark 3.0 to work. 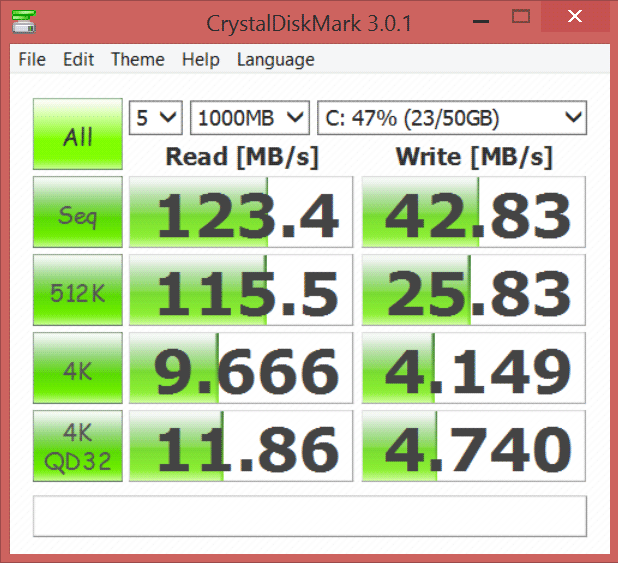 In CDM, we see sequential read/write speeds of 123.4 MB/s and 42.83 MB/s respectively, which is far better than the ThinkPad Tablet 2’s 83.69 and 34.49—and it absolutely crushes the Dell Venue 8 Pro’s 53.82 and 40.15. 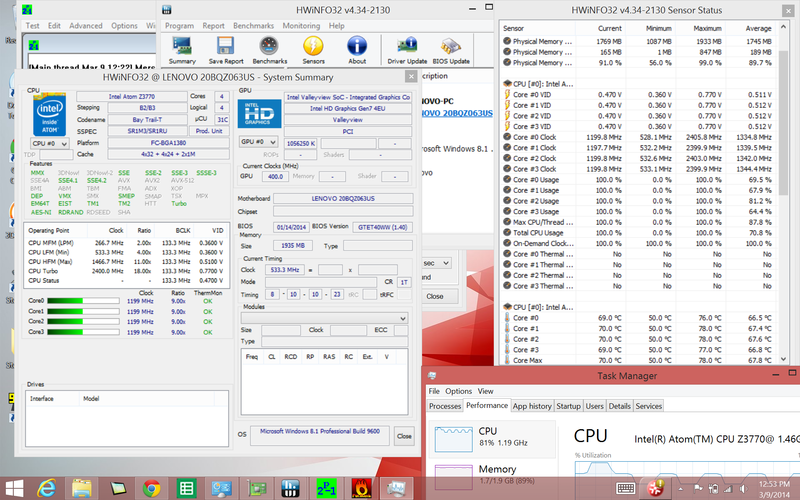 Somewhat closer is the Lenovo Miix 2 8, scoring 86.57 MB/s and 50.31 MB/s in that same benchmark. 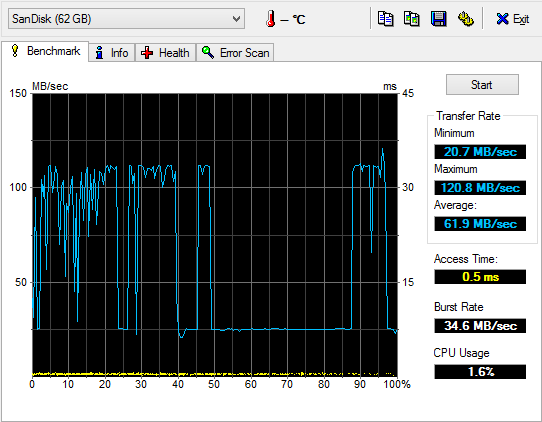 The only disappointment here is the ThinkPad 8’s 4K QD32 performance, which turns in scores of just 11.86 MB/s and 4.74 MB/s—rather slow in the grand scheme of things. 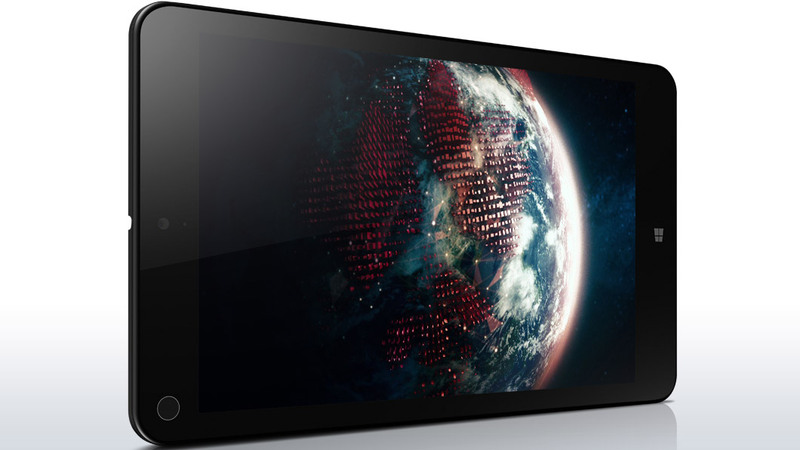 The integrated GPU in the ThinkPad 8 is HD Graphics (Bay Trail-T), and it isn’t meant to do any heavy lifting. 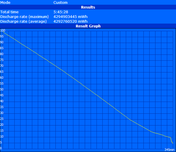 With just 4 EUs and a clock rate of up to 667 MHz, only basic graphical tasks will be possible. As a result, 3D gaming isn’t much of a topic with passively-cooled tablets, but we can evaluate GPU performance. In 3DMark 11 and 3DMark (2013), we find total scores of 209 and 9708/955/83 (Ice Storm/Cloud Gate/Fire Strike, Standard), which are about as dismal as we should expect from a machine lacking a cooling fan and sporting a measly 4W max TDP. Nevertheless, we experienced no trouble working smoothly at the tablet’s high screen resolution, and HD video and other items worked just fine on the ThinkPad 8. 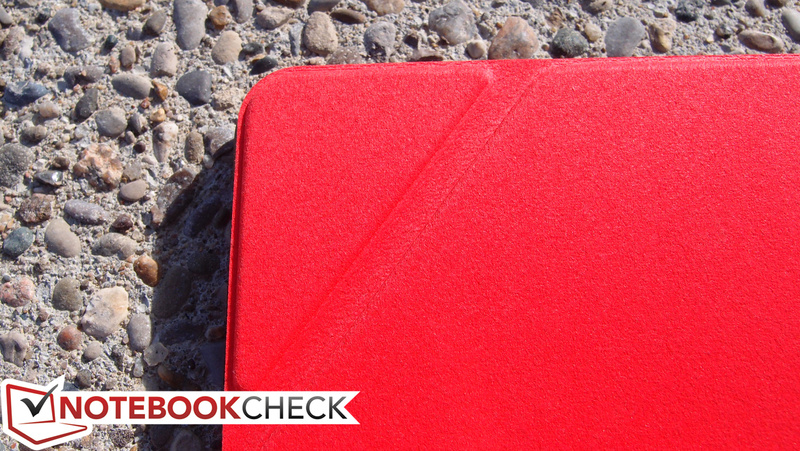 The ThinkPad 8 is passively cooled, and as such, it is completely silent. 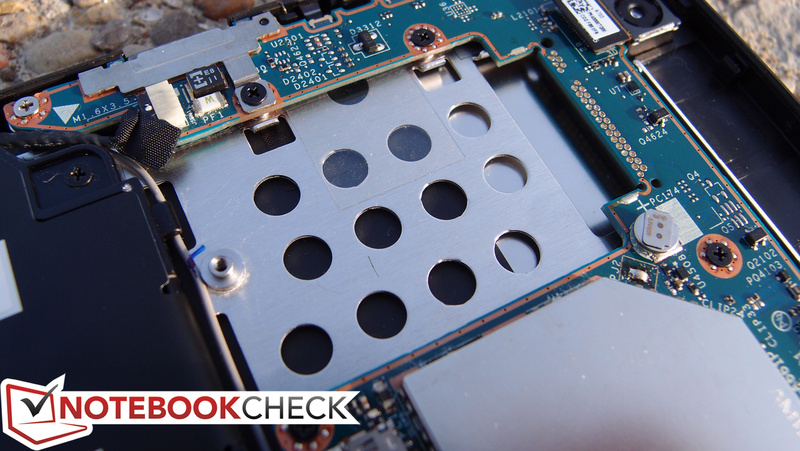 As with all devices lacking active cooling, thermal management is a hot topic on the ThinkPad 8. Still, temperatures remain manageable (if not a bit uncomfortably warm) even under very heavy load, with thermal averages of 38.9 and 37.3 degrees C recorded on top and bottom of the unit, respectively, and hot spots of only up to around 43 degrees C. While idle, conditions are thoroughly pleasant, with average temperatures of closer to 30 degrees C (top and bottom). Temperature isn’t much of an issue on the ThinkPad 8, though our CPU/GPU internal sensor readings suggest that aggressive thermal management practices are to thank for this, as we’ll see in the next test. When possible, we subject devices to a stress test to discern how well they can handle heavy loads of CPU and GPU activity. We use a combination of Prime95 and FurMark to simulate these conditions. 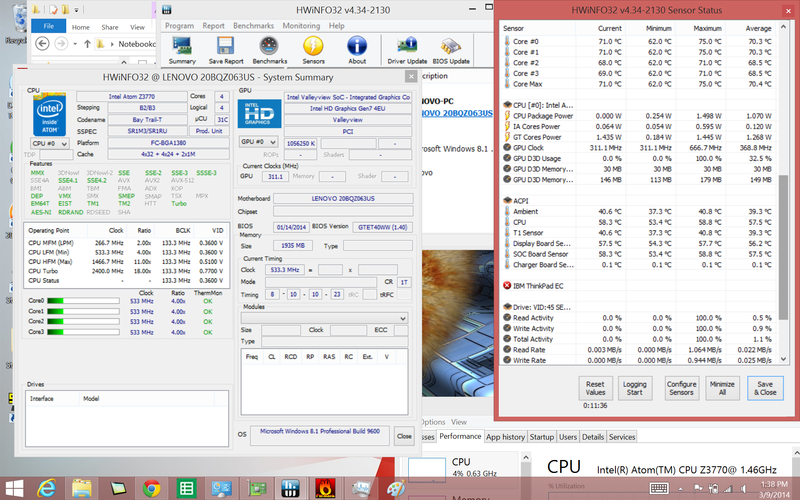 The ThinkPad 8 immediately reveals the same sort of aggressive thermal management as do other Bay Trail-T devices, and that results in performance well below the maximum possible clock rates of either CPU or GPU in any situation involving even moderate stress. For instance, in our CPU and GPU individual stress tests, we witnessed frequencies of around 1200 MHz (CPU) and 311 MHz (GPU), and regular sensor readings indicated that the SoC was reluctant to allow temperatures more than a couple of degrees above 75 degrees C. Meanwhile, when stress was applied simultaneously to both, the GPU remained at 311 MHz, while the CPU ducked down to a mere 533 MHz and remained there. We performed a subsequent run of 3DMark 11 directly following full system stress and received a significantly lower score of just 144, confirming that this throttling does in fact affect real-world performance of the device. 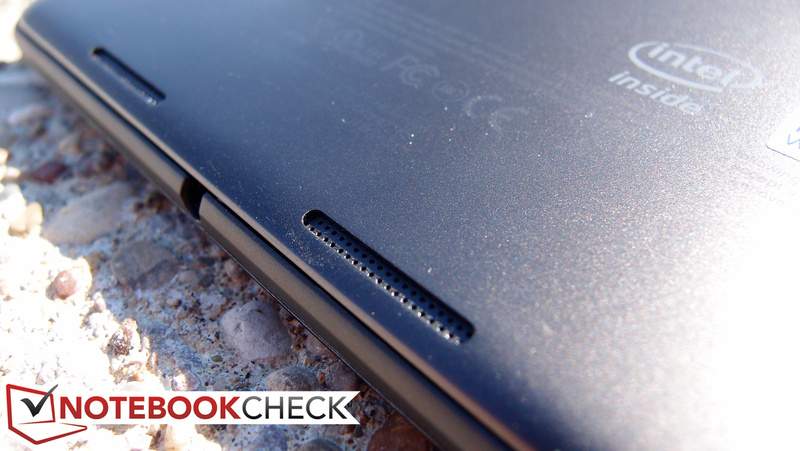 The two small rear-mounted speakers on the ThinkPad 8 deliver decent audio volume and reasonably clear sound, though it should go without saying that low frequencies are hardly reproduced at all. The speakers are a bit too easy to cover while holding the tablet, but other than that, they’re fine for everyday business purposes. 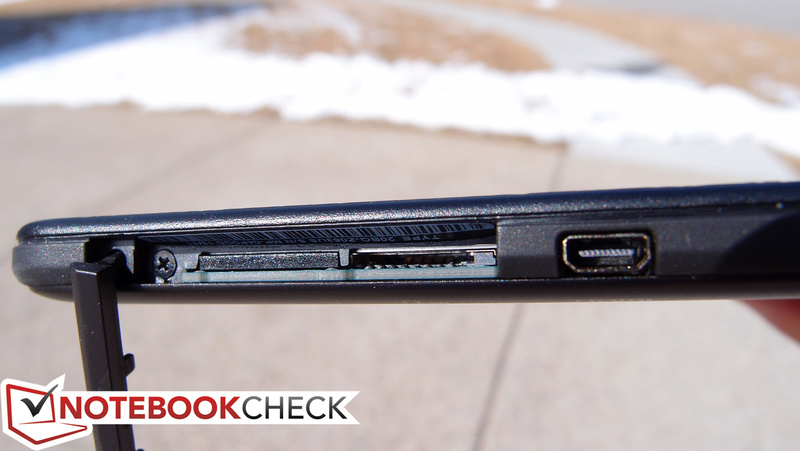 For all its strengths, the ThinkPad 8’s battery life left us thoroughly unimpressed. Managing 3:03 under load (Battery Eater Pro Classic Test) isn’t bad—though again, the low max TDP is mostly to thank for this. Meanwhile, just 10:07 with minimal load (brightness minimum, wireless radios off) is perhaps a more reliable morsel of foreshadowing. What it all adds up to is a mediocre result of 5 hours and 45 minutes of life while web surfing (brightness near 150 cd/m²)—hours less than some competitors (Lenovo Miix 2: 7:34, Toshiba Encore 8: 7:10), and borderline at best for a business device. 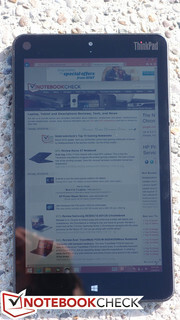 Although it has its share of limitations, such as lackluster battery life, missing stylus/digitizer support (and thus often difficult, imprecise navigation), and a glossy screen which could stand to be a bit brighter, the ThinkPad 8 still manages to rise head and shoulders above most of its competitors in nearly every other category. 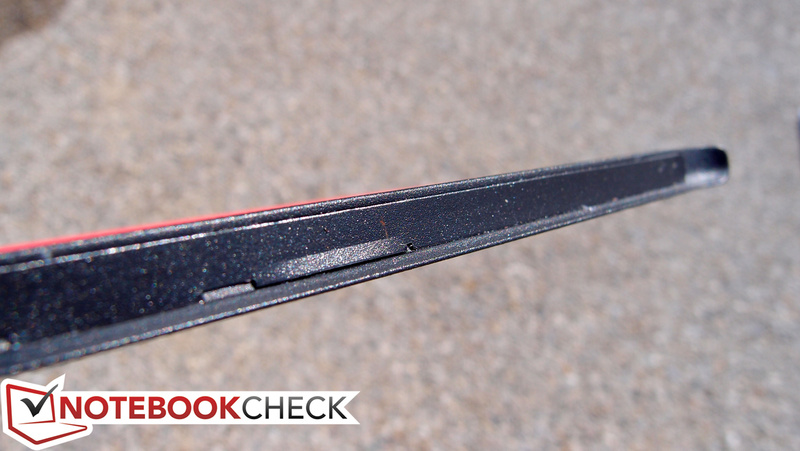 For starters, build quality is top-notch, featuring the same sort of solid, premium ThinkPad feel that we expect from the brand. 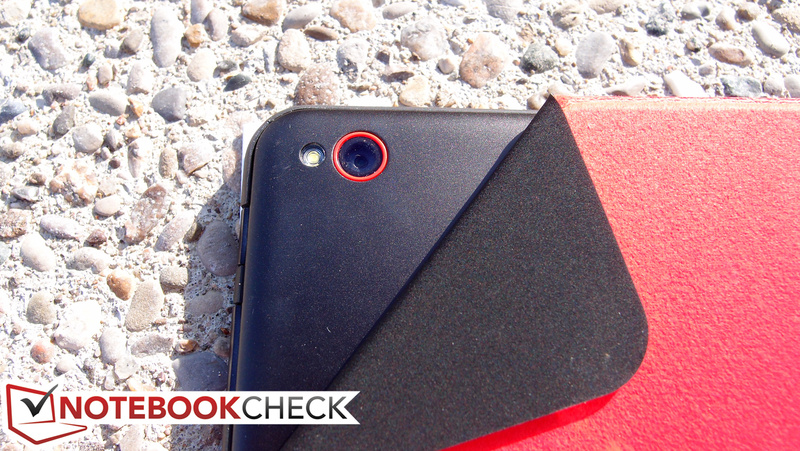 The screen is overall beautiful, with good contrast and color coverage and extremely sharp resolution. And perhaps most importantly of all, general system performance is excellent, rivaling even larger, higher-powered peers such as Microsoft’s Surface Pro 2. 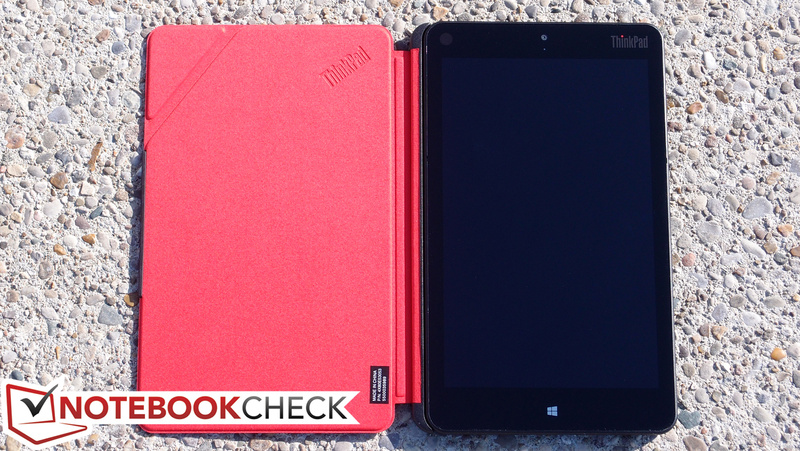 But today’s most relevant question is: does the ThinkPad 8 truly belong in the office? The answer, consistent and predictable in context with our findings from other tablet evaluations, is yes, but only as a companion device. Valiant efforts notwithstanding, manufacturers have yet to produce a solution that can replace a physical keyboard and traditional mouse pointer interface for productivity purposes—and while the ThinkPad 8 enjoys the future support of a fabled keyboard dock, today, it remains as hobbled in those areas as any of its brethren. 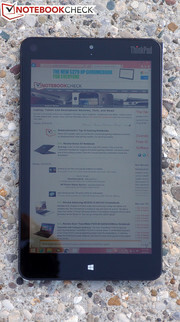 Nevertheless, as far as Windows tablets go, the ThinkPad 8 is certainly amongst the best of the bunch. 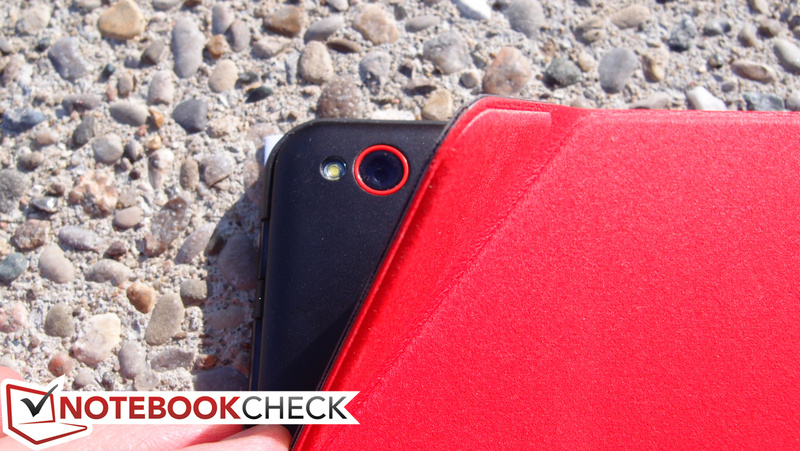 If you opt for one, just be sure to pick up a Quickshot Cover along with it—it’s worth the extra cash. 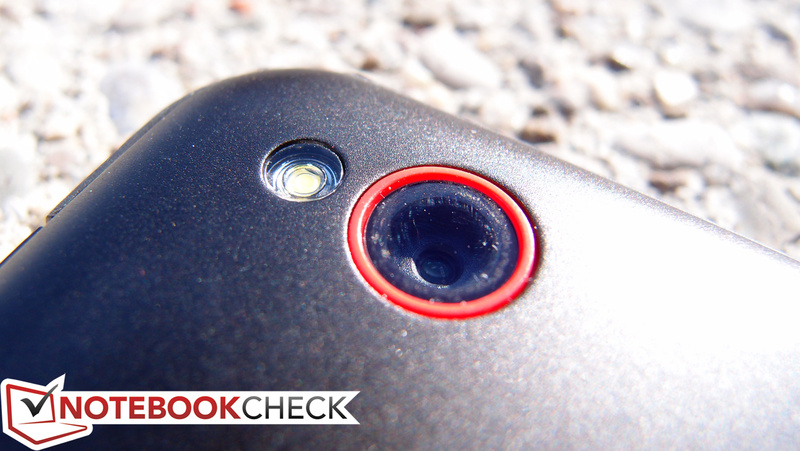 What about the rear-facing camera?